These would be a perfect “Thank you” to my daughter, Zoie, who had helped me out of a bind. That’s what happens when you have teenagers. They come to your rescue now and then. Don’t believe all of the bad press; teenagers may be a little moody and hormone crazed, but in my case they also happen to be wonderful. The problem was, I had gotten my dates mixed up for my big movie extravaganza day where I was going to a theater “festival” with one of my best friends to watch four out of nine of the Best Picture nominees. I had been looking forward to it for a month, but then somehow I woke up and forgot that this was the magical day and once my friend reminded me, I was frantically scurrying about my kitchen throwing snacks together. I had pictured this day quite differently and had planned on making some nice little gourmet sandwiches and having French Lemonade to sip but then in typical Geni fashion, I was running late and just throwing together whatever we had lying around; peanuts, pistachios, chocolate covered pomegranate seeds and pretzels were what I could come up with, but no makings for lunch. There was not going to be a lunch break during our 10 hour movie fest but only a 45 minute dinner break. The idea of hotdogs and nachos was starting to plague me as I raced upstairs to grab my purse. As I walked back into the kitchen, I found Zoie adding to my snack bags, putting a few napkins in and scrunching up the brown paper sacks so they would fit inside my ginormous purse. I felt a sweet pang as I realized that my daughter was taking care of me. Just before I ran out the door, she shouted out, “Bring Advil and tissues! You get headaches at the movies and sometimes you cry.” How does it go from buttoning up her sweater and stuffing her lunchbox to her packing my lunch and making sure I had everything I needed? Later, when I broke into my snack bag (all of 5 minutes into movie one), I found some surprise Gummi Bears added to my nuts and pretzels. Jackpot! Then during movie number two, I found the good stuff; crackers slathered with peanut butter. That’s when I needed the tissue; although the move was a real tear-jerker, my tears came when I found the crackers. Prep time about 30 minutes and 16 minutes of baking time. For Garnishes: chopped chives and a teaspoon of nonfat Greek Yogurt. OR if you are making them as appetizers, top with salmon roe on top of the Greek Yogurt instead of bacon crumbles. Oh yeah. To make the Frittatas: Preheat your oven to 375 degrees Fahrenheit. Spray the heck out of a regular muffin pan. The reviewers from Cooking Light said that they had trouble getting them out of the pan. I did not since I heeded their warning. This recipe makes about 14-16 so if you have another muffin pan, spray a few more muffin spaces on the second one and cook the two trays at the same time; otherwise you may have to wait to make a second batch. Peel and dice your potatoes so you they are small cubes. 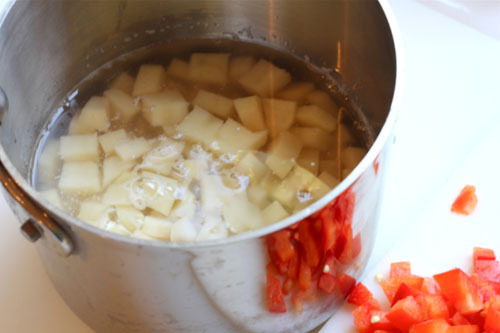 Place your potatoes in a small pot and add water to just barely cover the potatoes. Add a shake or two of salt to your water. Bring to a boil and cook until almost tender but not too tender since they will cook in the oven a little more later. Drain and run cold water over them when done to stop the cooking process. Reserve potatoes and set aside. Throw your 1/2 of onion in a food processor if you are lazy like me or chop by hand in a fine dice if you need a good cry. Chop your red pepper as well. Everything should have a nice, fine dice but not be mushy or tiny. Cook your bacon in a frying pan and dry the grease off of your bacon by rolling them in paper towels. In a saute pan, pour about 2 T. of the bacon grease into it. Turn your burner on medium-high and once the pan is hot toss in your onions. Saute onions for about a minute and then add the potatoes and red peppers. Throw in your thyme, salt and pepper. Saute until a little golden (about another minute or so). 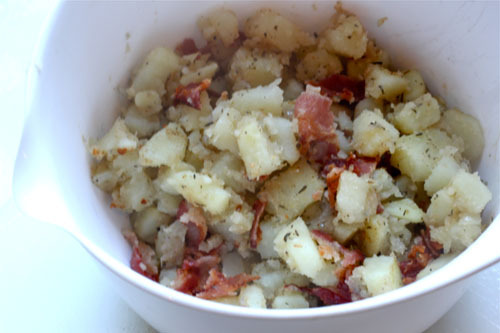 Crumble your cooled bacon into the potato mixture. To cool my potatoes, I put them in a bowl so that they didn’t stay hot in the pan. I knew I would be adding them to eggs and i didn’t want the eggs to curdle. Beat the egg beaters and three eggs together in a medium mixing bowl. Add a pinch of salt and a few grinds of fresh pepper like you would to scrambled eggs. Add the potato mixture and stir to combine well. Using an ice cream scoop fill each muffin cup 2/3 full. They will rise. Make sure to wipe off any spillage that occurred on the pan before you put the pan in the oven. The egg drippings would burn easily. I even wiped the top of my pan with a paper towel which had been doused in a little cooking spray to ensure the frittatas wouldn’t stick to the top of the pan should they spill over the rim. Top each uncooked frittata with a large pinch of the cheddar cheese (about a Tablespoon). Cook for about 16 minutes or until golden and firm. Adorable story and delicious looking recipe! I love Cooking Light and cook from there often. I might try making these tomorrow morning. I love this kind of breakfast! Awww…I know exacty how you feel with your daughter! Every now and then, and it gets more and more as the years pass, my daughter will surprise me with her caring and attention – imagine that, it’s not all about her all the time! What a fun long day at the movies!! I don’t know if I could last through that many movies, I get pretty antsy!! Yum on these muffins! Do you think they can be frozen and warmed up for a quick breakfast mid week? Aw, she’s a sweetheart! Love your movie marathon. And what a great Sunday breakfast, the frittata’s look delicious. I’m so making these after my juice fast!!! So yummy!!! Aw! Love movie marathon days! And, the Cooking Light muffin cup idea is brilliant! 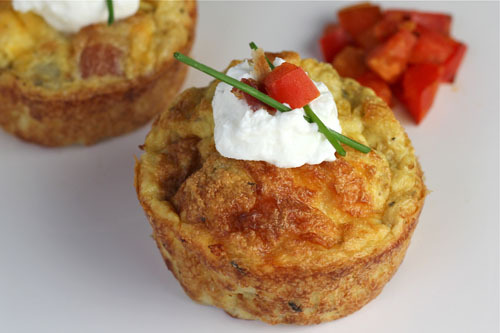 I love these mini-frittatas…what a great idea! So perfect for breakfast these are…and even more so for throwing together a quick impromptu snack! 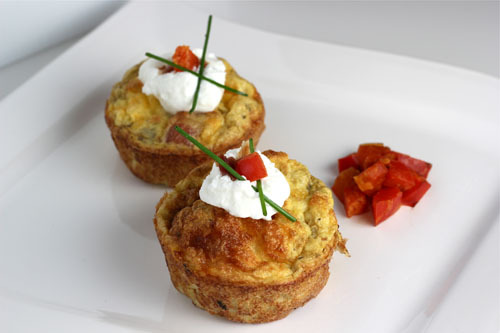 I love a good frittata and these minis are a great idea! I would love to se these on my table some Sunday morning. Your daughter sounds like a real sweetheart! How lovely – I want to give your daughter a big hug! Great muffins too! That is one delicious breakfast option. Love those photographs. It really looks like its something to crave for. Those look so cute! Perfect for a brunch! Wow, 10 hours at the movies! Any recommendations? What a fun story about your daughter, surprise snacks are always quite a treat. War Horse was fantastic but I cried the whole time. If you are a horse lover, a human lover and or a war hater, than this movie may make you cry harder than you have cried at any movie. But it was pretty spectacular. These are so cute and a brilliant idea for a bite-sized breakfast! Lovely! Thanks for sharing. You have a great blog and I’m glad to have found you! These are great even as dinner! What a sweet daughter you have! Isn’t it wonderful to be able to say good things about your teenagers? I love making mini frittata’s, so easy and convenient for food on the go! Hope you had a fun movie extravaganza! how cute and delicious all at the same time! 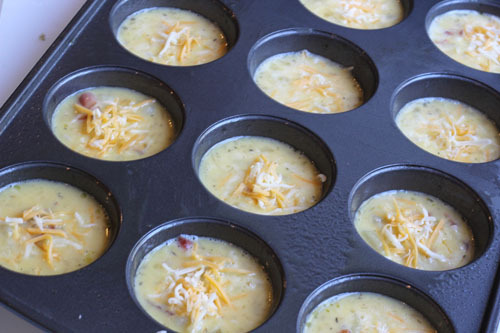 I love the mini frittatas- i am thinking this would be perfect for my son and husband on the go! Your daughter really does rock. I’ve been wanting to do the all day Oscar movie marathon as well. I think actually put it on the calendar and do it next year! It sounds like fun and definitely an event requiring plenty of great snacks. Just look at those amazing mini frittatas. They are calling me. Good thing I don’t have these right now though, I would eat too many of them lol. And these mini frittatas, they look amazing. I need to make these to have as breakfast through the week. my mouth is watering. wow… i NEED one! What a sweet daughter you have! These look like a delicious way for you to thank her 🙂 Love how you made them mini, too. Make them easy to grab and go! Aww your daughter is the sweetest! It’s when they surprise you like that that you know you raised them right. 🙂 She totally deserved these awesome mini frittatas. YUM. That is so sweet! so there is hope for the teenage years! I love the idea of a movie marathone! a brilliant way to break routine. Fairly healthy, substitute whole eggs with egg whites! !